We will wrap up this week of celebration with yet another fun series of stories! I planned/plan on reading them all in conjunction with the Maud Hart Lovelace Challenge which is being hosted by Sarah at Library Hospital during the month of October. And yes, I'm reading ahead. 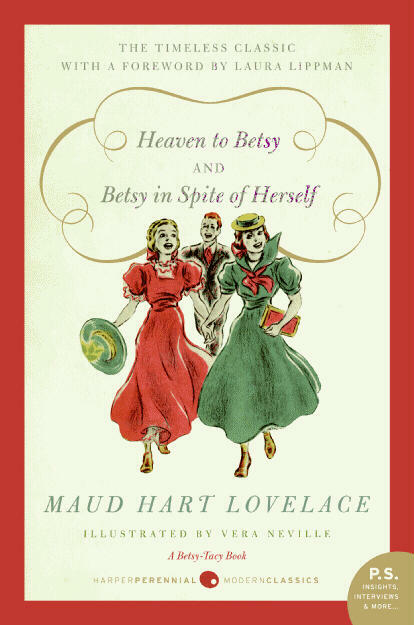 I finished reading Heaven to Betsy and Betsy in Spite of Herself this past week and you'll see a more detailed review of those two stories popping up next week. (I'm also about halfway through Betsy Was a Junior.) In the meantime though, in conjunction with this Birthday Giveaway Week, thanks to Harper Collins, I have a set of these three(/six) books to give to one of you! In order to win, simply leave a comment below. This contest is open to U.S. Residents and will be open through Thursday, September 9th. If you DO happen to win these books, I would enthusiastically encourage you to participate in the Maud Hart Lovelace Reading Challenge which Sarah is hosting. If you've never read Betsy before, you are really missing out! And if you haven't yet read about Betsy's high school years, then you can catch up just like I am! Thank you, Harper Collins, for your amazing generosity and for republishing these titles for a new generation of young (and older) girls to enjoy! 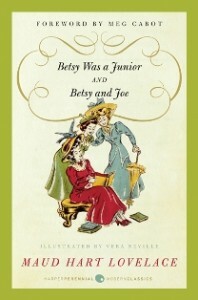 OK, you said I'm really missing out if I've never read Betsy---and I don't wanna miss out! I'd love to chance to read these books. They look like good, old-fashioned fun! I haven't read these though I did pick one up at a used book sale. Based on your recommendation I'd love to add to our collection. I have all those but the last one but I know a little girl at church I could happily pass the duplicates on to! We love Betsy-Tacy! I've been meaning to read the Betsy-Tacy books and haven't yet. Winning these could inspire me to catch up! I have part of the series, but not all of them. I've love to win! My dd8 is collecting the Betsy-Tacy books and these would be the very next books she needs. Here's to hoping to win one of your giveaways! Please enter me. I don't want to miss out either. :) I love the covers to these books! I've never read THAT Betsy before. My childhood was filled with Carolyn Haywood's Betsy. I've heard a lot about the Betsy-Tacy series though, and I'd like to try them! I have many friends who are big Betsey-Tacy fans; sadly, I've never experienced them. I've love the opportunity to read them, after which I'll donate them to my local library. I have read them, but don't own them--I'd love to revisit Deep Valley!!! I have not read any of the series but have heard so much about them. Please enter me. I would love to read them. Thanks. I would LOVE to own these! Sign me up! We read the first two earlier this year, and my daughter loved them! I think she'll be ready to read them herself soon. I'd love to win these to have for when she's a little older. Ooooh, I remember reading the Betsy-Tacy books (although I think it was her younger years) when I was a kid! Would love these! Wohoo! Good timing. I've advertised this give-away on my special announcement post that will appear tomorrow. Thank you for this-I have not read any of these books and am anxious to read them. Thanks for the giveaway! I've never read these books. It would be lovely to meet her so I will be doing the challenge as well!! How fun to own some books to begin my adventure! I have never read any Betsy so I hope I win. Yes, these I want too! I have not read any of these books and would love to win them. Read and loved these as a youngster. Introduced them to my two daughters who remember them with fondness. Now my eight year old granddaughter has started the series. Mom, Grammy, and granddaughter, all reading them together. I would love to read these books. I've never heard of this series, but I'd like to check it out. Please enter me. I've heard of this series, but I have never read any. Would love to read them. Please enter me! I have never read any of hte Betsy books and they look like they woul dbe fun reads, please enter me! I've never read these, so would love the chance! I've heard so many good things about these books. I'd love to read them! We posted about your giveaway at Winning Readings. Oh, never heard of Betsy .. can't wait!! I'm not familiar with this series. I feel like I'm missing something terrific. Please count me in! Thanks for the chance. I'd hate to think I've missed out on reading some great books so I would love to be entered into your giveaway to win these books. Thank you for the opportunity. My granddaughters would enjoy these books! Thank you for the giveaway! I read my first BT book when I was seven. I collect every edition I can get my hands on. Thanks for the chance to add these! Please enter me! Thanks so much! Oh, I'd like to read these! I've heard of them, but never read any of them. Please enter me. I haven't read these and would love to enter. I've been reading Betsy since I was a kid. I also buy the books to give to girls and adults girls whose educations have been neglected. Would love to win a set to give away. I loved these when I was a girl and my daughter is just the right age for them! I just LOVE these books and love the new look. 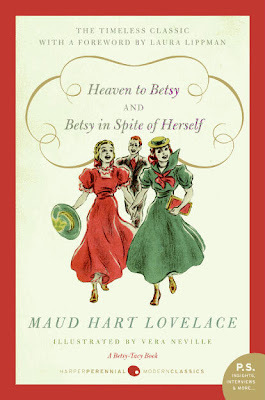 Betsy-Tacy books are timeless and I'm so excited so many new people will be exposed to them. Yay. Read these books when I was younger. Great books! One of the best series ever written, and these covers are beautiful! I'd love to have this set to share. I would love to win these books as I have never read them and am from Minnesota. My daughter read one of the books in school. Yes, if I win, I will participate in the challenge. I've never read Betsy. I'd love to though! would love to win. all I can find at the library is the first one. 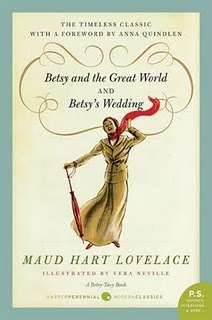 Despite reading many great reviews, I still haven't read the Betsy-Tacy books yet but they are on my list! I always love checking out new young adult titles. These look interesting! I love these books, but don't have my own copies! Thanks for the giveaway! I love love love Betsy-Tacy! And I'd love to win one of these lovely new copies!